What's happening with that church condo on Jones? 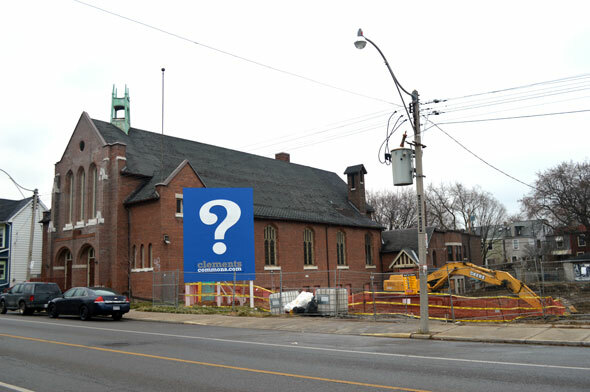 The Church of St. Clement Riverdale on Jones Ave. was supposed to have been converted into condos by now. In 2012, when the St. Clement's project was announced, the developers set an occupancy date of June 2014, but today there's a big question mark over the site. Literally. The delay in construction was caused in large part by a change of ownership. The original developer - William Tessler of Sonterlan Corp. - quit the project this summer and two new companies, De Cartier Development Corp. and LifeStyle Real Estate Investments, have since taken over. "Through numerous miscalculations, whether it was the market, whether it was pricing, timing, the people he had working with him, [Tessler] pulled the plug on the project," says Alex de Cartier of De Cartier Development. "There seemed to be a lot of interest in it, but it didn't fly." The project, which would have seen the former church converted into condos and a new residential building erected next door, has now been split in two, with De Cartier Development handling the renovation of the church and LifeStyle taking responsibility for delivering the new building. "We basically ripped apart the whole idea," says De Cartier. "The work that [Tessler] had proposed really took a lot of the charm away from the building." De Cartier plans to spend about $5 million converting the church into 16 upscale condos while keeping intact heritage aspects such as the internal gothic arches, pillars, wood paneling, and stained glass windows. "We're showing the owner, 'hey, you are in a church, you are in a 100-year-old building.'" Next door, Luke Wywrot of LifeStyle is taking on the challenge of putting up the new townhouse building. He says the designs have also changed significantly since 2012. "Before it was more of a condo development, now we're going to have a combination of stacked townhouses and regular townhouses," he says. "We're going for open concept, very modern ... we want to distinguish ourselves from the church." The 12 townhomes will be built with a small courtyard out front facing Jones Ave., Wywrot says. He hopes to have work complete in late 2015, around the time construction wraps on the church. The city still needs to approve the proposed changes to both projects, however. "I'm not sure who's going to finish first. It will be a race," Wywrot jokes.